Amber Rose took to Twitter on Monday to commemorate her first wedding anniversary with hubby Wiz Khalifa. She shared a series of new snapshots from their 2013 nuptials, which also features the couple's adorable son Sebastian Taylor Thomaz. "Today was the day we said our vows before God and our Family. I knew as soon as I met u, u were the one for me sweetheart. Happy 1 year anniversary @mistercap and many more to come," she wrote along with the cute candid. In the pic, the blushing bride is donning a strapless, multi-layered lace and tulle gown with a diamond headpiece. And yes, this is the first time we've seen her in this dress. Meanwhile, Wiz is rocking a magenta sport coat, black pants and a black bowtie and baby Bash is sporting an all-white outfit with black Converse sneakers. Amber also shared a pic with her mama, writing, "My beautiful Mommy and I on my wedding day." Just five months before their big day, the duo welcomed their first child, baby Bash, into the world. 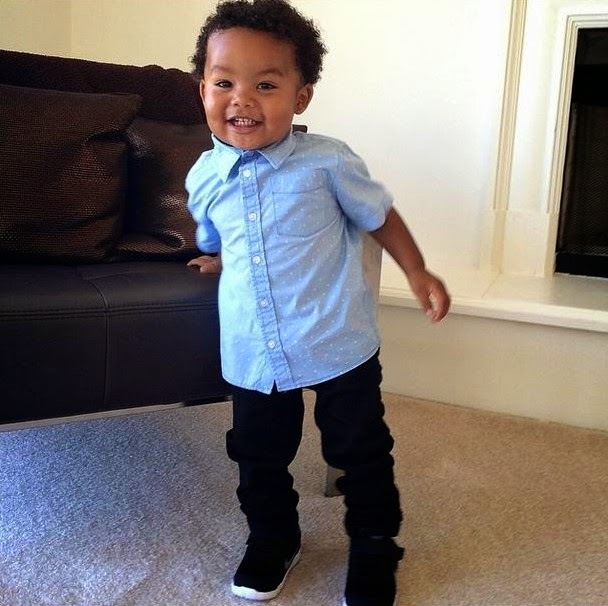 "Happy Birthday Sebastian 'The Bash' Taylor Thomaz!!! Everyone welcome this perfect young man into the world," the rapper wrote on Twitter last year. Can you believe how big Sebastian has gotten -- take a look at him now below!